Sun damage is the number one cause of aging skin. 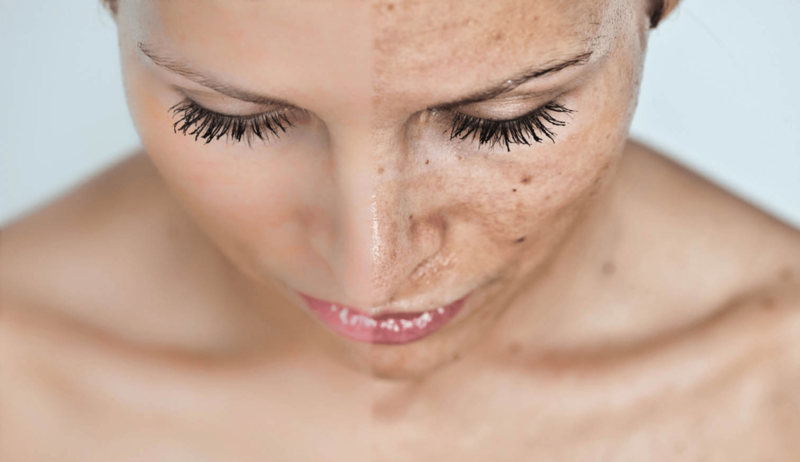 With Photorejuvenation, you can eliminate brown birthmarks, sunspots and revive your skin in just 30 minutes. Photorejuvenation (or Photofacial) is a non-invasive dermal procedure that uses intense pulsed light (IPL) is used to improve skin clarity and texture for an overall even, younger-looking complexion. This safe, quick and simple treatment can be completed in as little as 30 minutes, making it the perfect lunch hour facial. Each photorejuvenation treatment is tailored to treat the client’s specific skin concerns, as well as their unique skin type. This ensures superior cosmetic results and supreme client satisfaction. Photorejuvenation harnesses the power of IPL energy to gently, yet effectively, reduce skin pigmentation and uneven texture. The IPL device consists of what looks like one very bright light. However, the mechanism is actually many different wavelengths of light, each of which is attracted to a different skin condition. The lights can absorb red discolouration (rosacea, broken capillaries, spider veins, blotchiness), slough off brown discolouration (birthmarks, age-spots, acne scarring), and stimulate the production of new collagen, all at once. Your Enlighten Laser technician will start the treatment by applying a cold gel to the desired area. You will be given protective eyewear, as the light is exceptionally bright. The smooth surface of the IPL device is then gently applied to the skin, and short pulses of light are applied. The sensation has been noted to be completely bearable, like a slight sting or snapping of a rubber band against the skin. As the procedure does not disrupt the skin’s surface, there is no downtime required. Most clients have found they are able to return to their regular schedules immediately after treatment. What results can I expect with Photorejuvenation? In order to achieve optimal results, an average of five or six treatments spaced about three to four weeks apart is recommended. Throughout treatment and for a few weeks after the post your final session, skin will gradually start to appear smoother, firmer and more refreshed. Tone and texture of skin will be vastly improved, resulting in a more refined and polished complexion. All in all, skin will appear naturally rejuvenated, as if you have started to age backwards. Immediately post-treatment clients may experience temporary redness, however this tends to subside within 24 hours. Any brown spots will become darker before naturally flaking off within a few days. In order to protect the skin from further damage, we ask our clients to avoid sun exposure of the treated area and apply sufficient sun protection. Your expert technician will walk you through our best aftercare practices once treatment is over. How long do Photorejuvenation results last? Results largely depend the individual and the environmental factors they are exposed to. Most clients experience lasting results for a few years post their final treatment and have the opportunity to extend results with touch-up treatments every three to four months. During your free consultation, your technician will create an individualized plan to create the best results for your specific skin type and your skin concerns. To book a photorejuvenation treatment at any one of our nine locations, click here.